Insecure library loading or dll hijacking vulnerability occurs when libraries are loaded from a location not intended to load from due to how Windows search order works when searching for the library. This really comes down to developers not specifying the fully qualified path name of the library or not initially calling SetDllDirectory() with a blank path in its code. So for example when opening a document the application searches for the required dll and if located in the current working directory of the document the dll will get loaded from this location. The value data can be 1, 2 or ffffffff. If the value name CWDIllegalInDllSearch does not exist or the value data is 0 then the machine will still be vulnerable to attack. Please be aware that the value ffffffff could break certain applications. Depending on the value you choose you still might be vunerable. After doing some tests I’ve produced this table below hopefully making it clearer as I found the Microsoft advisory a bit confusing. WebDav share has to be connected as an unc share i.e. \\192.168.1.6\webdavshare or mapped to a drive letter. Exploitation via WebDav shares can be mitigated by disabling the Webclient service. Finally, when testing WebDav connections you might end up getting this error “The workstation driver is not installed”. If so you’ll need to stop the WebDav Client Redirector driver (C:\>net stop mrxdav) and then start the WebClient service again. The desktop.ini is a standard text file that can be placed in any Windows folder to customize certain aspects of the folders behaviour, i.e. what the folder icon should be, what folder name to display, etc. 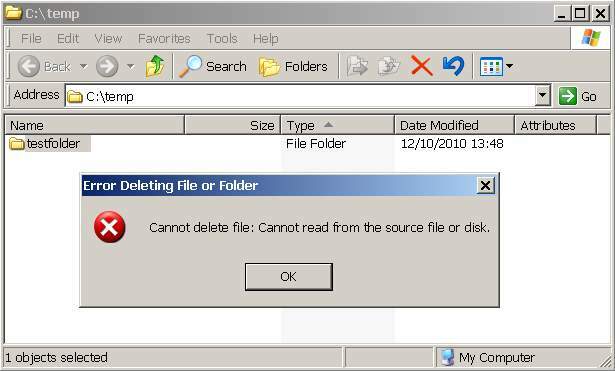 The desktop.ini file is normally a hidden file so to display existing ones in folders you’ll need to make it visible by opening the folder and clicking on the Tools menu . . . Folder Options and selecting View. Then select “Show hidden files and folders” radio button and also uncheck “Hide protected operating system files (Recommended)”. Below I have touched upon three customised folders and the ini files it contains. For Favourites folder the folder has to have attributes of either readonly or system or both for the folder to change to “favourites” from the actual folder displayed in Explorer. The desktop.ini file can have any attribute and below is an example of the ini file. The LocalizedResourceName parameter can be used to change the folder name to something else when viewed in Windows Explorer. Certain system folders use class ids to define the folder properties. Here again the folders attributes define the folder properties and the desktop.ini file can have any attribute set. For the Scheduled tasks again changing the folder attributes to system or read only makes it change to the tasks icon. So what does this mean from a malware point of view? Well these kind of system folder properties malware files can be easily hidden from view. i.e. having a job in Windows tasks (C:\WINDOWS\Tasks) with a hidden attribute set on the job file will be invisible even with all files and folders set to show. 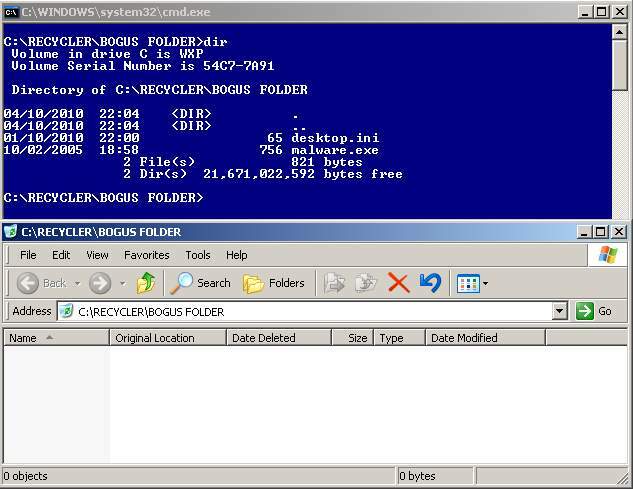 The same goes for the recycle bin where malware writers create a bogus recycle bin folder containing malware files which when browsed through Explorer remains invisible and only genuine deleted files are shown to the user.